The iconic Liberty Bell replica atop Veterans Stadium is shown in 1986. 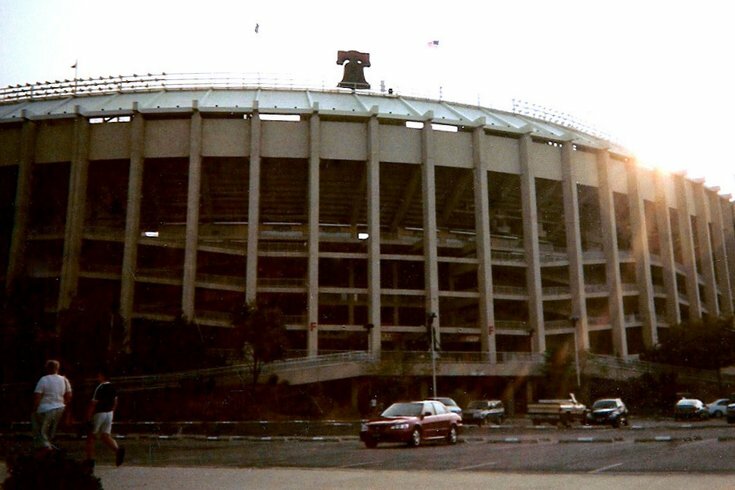 It seems hard to believe, but 15 years have passed since Philadelphia said goodbye to Veterans Stadium, where the Eagles and Phillies spent decades thrilling and destroying our souls. In its latter days, the Vet was routinely disparaged as a junky building that served as a hive for bad behavior. Its reputation was centered around notorious moments — the snowballs, the courtroom, the turf, a Barry Bonds brawl — that overshadowed its charm. In 1964, Philadelphia voters approved a $25 million bond to construct Veterans Stadium. It was an investment that arguably cemented the city's status as a sports town after former franchises like the Athletics and Warriors skipped town. Cost overruns required another $13 million bond in 1967, and at a total cost of $60 million, the "octorad" style stadium was among the most heralded of its time. These days, few people would trade Lincoln Financial Field or Citizens Bank Park for the Vet. It's nice having separate stadiums for the Eagles and Phillies, and both teams have won championships since they moved to their new buildings. But it's impossible not to feel a bit nostalgic every time memories of Veterans Stadium come to light. Here's a look at some of Twitter's best reactions (and a few extra videos, for sentimental purposes) to the 15-year anniversary of the Vet's demolition. I was annoyed by the local and national media's commentary that day, mocking the Vet and celebrating its destruction. It was a dump, but I loved that place and so many of my core memories were formed there. As a Philadelphia sports fan, Veterans Stadium is a big part of my story. Today’s first take: it’s been 15 years to the day since Veterans Stadium was imploded. That place was a dump, yes, but it was our dump. The greatest venue ever to watch a sporting event was the Vet. Period. Change my mind. Chase Utley was destined to be great from his first ever MLB hit.